CEO-2D-800 and CEO-2D-800-V are ultimate tools in any Ti:Sapphire laser laboratory. Designed for spectrally and spatially resolved interferometry (SSRI), these spectrographs are capable to measure angular and material dispersion with extreme high accuracy (with the additional use of PhADIM-D). They are also compatible with conventional pulse characterization techniques, like FROGand SEA-SPIDER; and beyond that, they open a way to unlimited experimental applications. 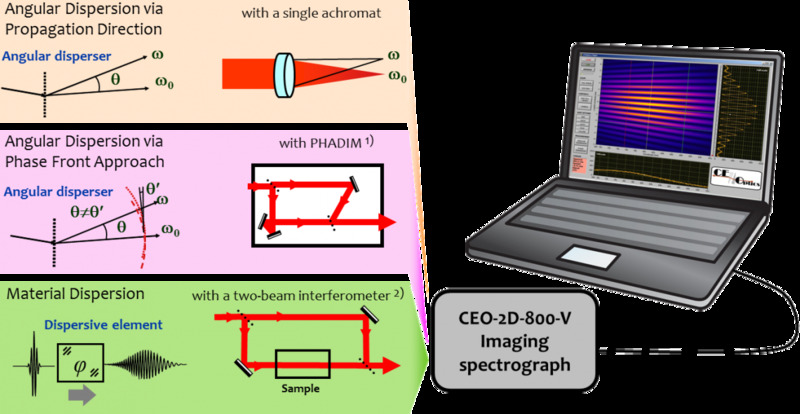 CEO-2D-800-V offers a variable wavelength range, which is inevitable when accurate spectral measurements needed for pulses with diverse bandwidths. Our device can be switched easily between three different wavelength ranges.